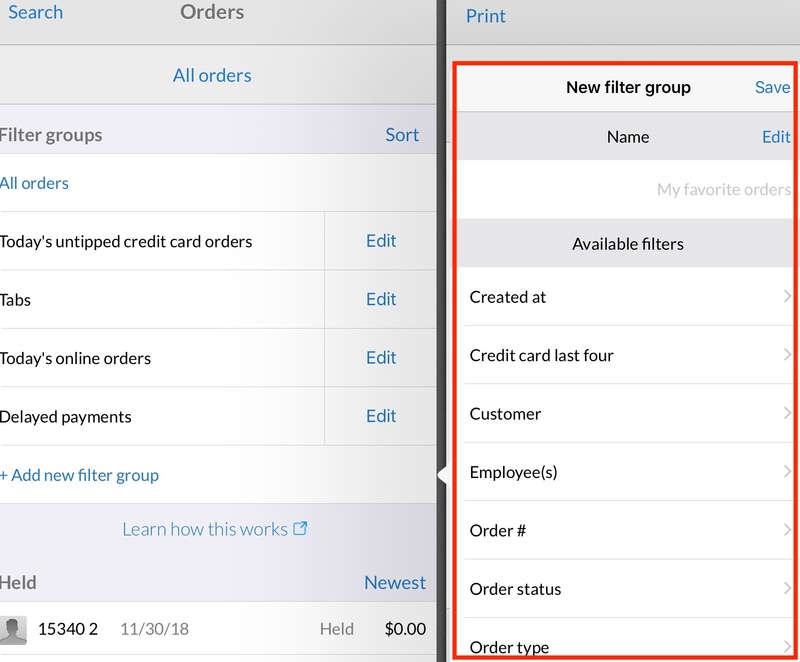 Now you can create customized filter groups to help you sort orders to best match your workflow and search for specific orders in your sales history. 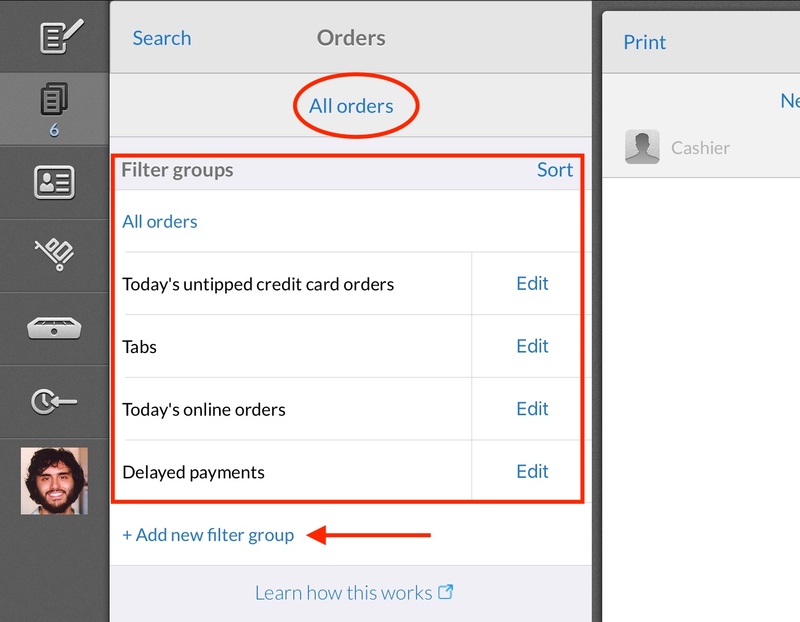 Filter groups are useful if, for example, you want to view all of today’s untipped credit card orders to quickly add tips in bulk, to see a list of all open Bar Tabs, or to view all of your online orders in one place. We start you with a few pre-built filters groups, including those listed in the left-hand pane below. 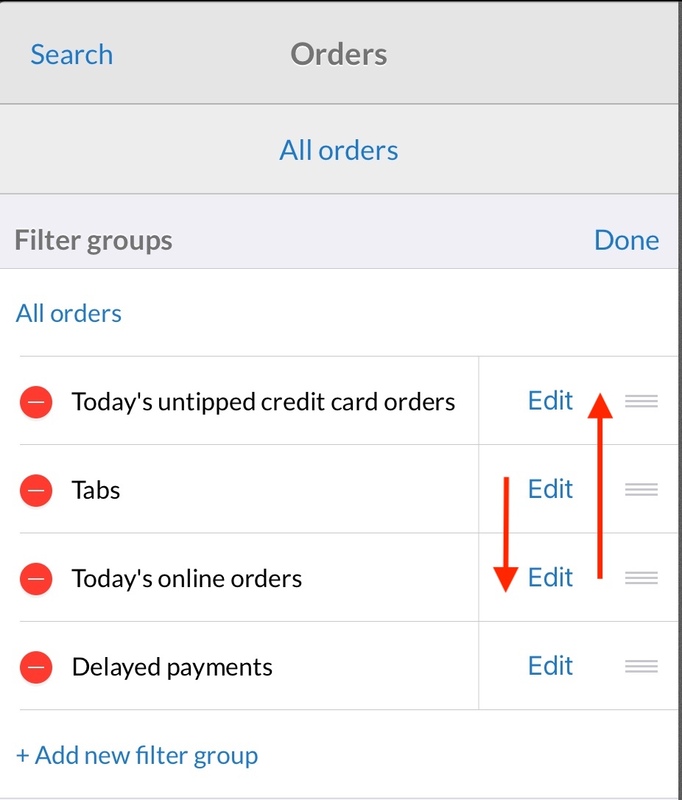 Access these groups by touching the Orders tab, then the All orders button, then selecting the filter group you’d like to view. To create a new filter group, touch + Add new filter group, name the group, then select from the available filters before clicking Save. You can sort these groups by touching the Sort button then dragging and dropping your groups into preferred order. You can delete a filter group by touching the red minus symbol while sorting or just swiping right to left then touching Delete. To search for a specific order, touch the Search button at the top of the Orders pane then use the available filters to narrow your search. If you know when the order was paid, you might choose the Paid at date filter. If you know the customer’s name, you might you use the Customer filter. Note that filters can be combined to narrow the search more quickly. Internet access is required to conduct a search as we are looking through your entire order history on Instore. Available filters include Create at date, Credit card last four, Customer, Employee(s), Order #, Order status, Order type, Paid at, Payment type, Taxed or not, and Tipped or not. Note that these same filters and search capability is available on Office on the Orders report.